The Philippine national men’s basketball team Gilas Pilipinas has failed to secure first victory in the FIBA Basketball World Cup after Argentina won in a thrillingly close game, 85-81 early Tuesday (September 2 in Philippine time) at the Palacio Municipal de Deportes San Pablo in Seville, Spain. Argentinian Andres Nocioni earned a trip to the free throw line but only connected on one of his two attempts to make it 83-81 in the final minute. Gilas Pilipinas turned to Jayson Castro, who was whistled for a travelling violation after a failed three attempt on 81-83 score. Jimmy Alapag put Gilas back in the fight by hitting triples in the deciding quarter, including one with over two minutes left that brought the Philippines within one, 81-82. Argentina trickled in triple at the halftime buzzer to lead the match 43-38. Gilas had the best start of the game, leading at early in the first quarter, 12-2 that was a result of a superb ball movement and even with the absence of Andray Blatche. 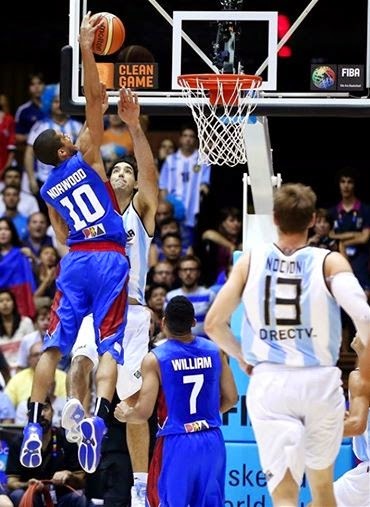 It was a historical moment when Gabe Norwood dunked on Argentine star player Luis Scola who currently plays for the Indiana Pacers of the National Basketball Association (NBA). But it wasn’t enough for the Filipinos to stun the World No. 3-ranked team even with excellent defensive play. Gilas will try to succeed match against a struggling Puerto Rico on Wednesday night (September 3).